In a longer leg (all the more room to enjoy the great diamond-on-diamond, hearts, fairisle and striped patterns) these Heat Holders 1.6 TOG Lite Patterned and Striped Knee High Socksare in their new, lighter medium thickness design, specifically conceived for casual fit boots and shoes. 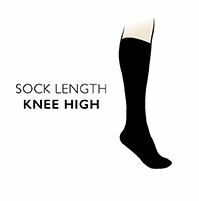 But even with the lower bulk, Heat Holders 1.6 TOG Lite Long Knee High Socks can still deliver four times the warmth of conventional cotton socks. Heat Holders knitting technology and intense brushing process makes their socks more thermally efficient, as well as soft and fleecy next to the skin. These longer Heat Holders are also comfortable to legs, made to be non-binding so they don't impede circulation with pressured elastication. This makes them diabetic friendly too, so everyone can enjoy relief from cold feet.